Flex Tip Kid's Character Thermometer,This 30-second thermometer with flexible tip is reliable and comfortable to use. It is Celsius and Fahrenheit adjustable,recalls the last temperature taken, has a fever alarm with cute tops. 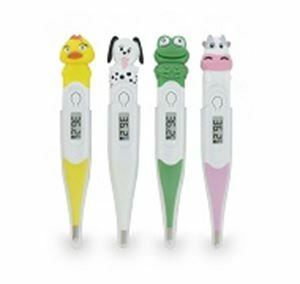 This 30-second thermometer with flexible tip is reliable and comfortable to use. It is Celsius and Fahrenheit adjustable,recalls the last temperature taken, has a fever alarm with cute tops.